At Wright State, we believe the dream of a college education should be a reality for anyone willing to work to achieve it. For some students, the availability of scholarships can determine whether or not that dream comes true. Though Wright State’s tuition is among the lowest in the state of Ohio, many students still struggle to make ends meet. Scholarships can help lift financial burdens for some, while rewarding others for outstanding academic achievements. Your support of Wright State scholarships will help us meet the needs of students from a wide variety of backgrounds. From the outstanding scholar to the first-generation college student, the working mother to the military veteran, students from all walks of life need your help to earn their college degrees. Reward Academic Excellence—Awarded to Wright State’s highest achieving students, merit-based scholarships recognize academic excellence and talent in all fields of study, from the STEM disciplines to the fine and performing arts. They help us remain competitive by attracting the best and brightest students from across Ohio, the nation, and the world. Provide Real-World Experiences—In today’s competitive job market, employers are looking for well-rounded graduates with a wealth of experiences inside and outside of the classroom. 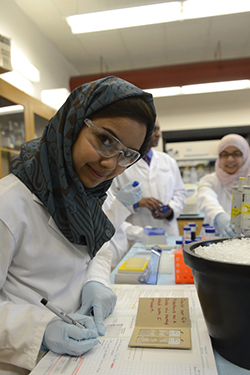 Scholarships give students the chance to engage in hands-on, experiential learning through research, internships, co-ops, and study abroad programs. Enhance Student Life—Wright State encourages students to fully engage in campus and community life. Scholarships support students who are involved in campus organizations, student leadership, and community service. Foster Student Success—While many Wright State students juggle the responsibilities of school and work, it is not unusual for students to simply run out of money as they are progressing toward their degrees. To keep students in school and on track for graduation, scholarships support students with the greatest financial need. Supporting scholarships is one of the best ways you can immediately impact the lives of our students and lay the foundation for their future success. You may make a gift of any amount to an existing scholarship or establish a named fund of your own. Establishing a named scholarship gives you the option of creating a fund that will provide immediate support to students (annual) or leave a legacy for future generations (endowed). As a nursing student, Joyce Rutherford-Donner had to juggle the responsibilities of going to school and being a single mother. The 1982 Wright State graduate has established a scholarship to help current students who are facing the same challenges today.